Ekasilicon has an atomic mass of about 73 u. In 1869 Mendeleev arranged the elements by their mass and proposed that certain properties recur periodically. However, his table contained gaps (shown below in orange), because certain elements had not yet been discovered. He called these elements ekaboron, ekaaluminum, and ekasilicon (now called germanium). Ekaaluminum and ekasilicon lie between Zn and As — 10 mass units apart. 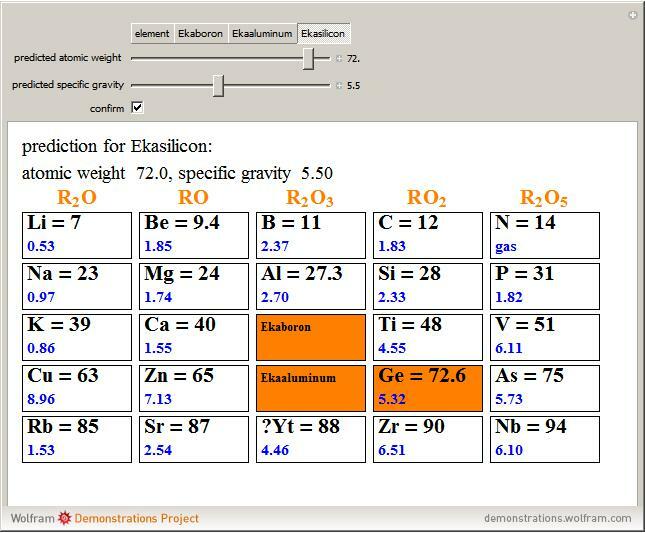 If the atomic masses increase smoothly from left to right (about 3.3 units per atom), then ekaaluminum should have an atomic mass of about 68 u and ekasilicon should have an atomic mass of about 72 u.
Germanium was isolated in 1886. Its atomic mass turned out to be 72.6 u.